Now, can we get back to drilling, please??? So, the oil in the Gulf of Mexico is disappearing much more quickly than expected. Nature is taking its course, aided by a naval-size flotilla of skimming boats and some powerful chemical dispersants. Doubts remain about the long-term underwater affects of the oil on the ecosystem, but the greatest tragedy remains the 11 lives lost when BP's Deepwater Horizon rig exploded on April 20, causing the well to rupture. On Friday, the company's new chief executive Bob Dudley announced that the clean-up operation could now begin to be scaled back. It was one of the American's first public utterances since replacing Tony Hayward as chief executive. In an earlier appearance before BP employees in Britain, Dudley praised his predecessor for having the decency to stand down "just when things are starting to go right". It was not something Dudley would dare to say in the United States, where Hayward, as he acknowledged last week, remains a villain. There are understandable reasons for this. His "I want my life back" remark was callous in its carelessness. You also don't compare the biggest oil leak in US history to a "drop in the ocean", even though that has turned out to be more or less the case, when your company is responsible for dumping 60,000 gallons a day into the sea, and when it has probably been economical with the truth about the size of the outflow. But Hayward's pillorying revealed how the well-spoken scoundrel remains a latent British stereotype, one that is connected to the "don't-forget-we-kicked-your-butts-in-1776" smirk that can easily greet a British visitor on July 4. It was also a reminder that the primary purpose of a scapegoat is to deflect blame. Amid the anger at BP, there were very few in government, the environmental movement or the media prepared to acknowledge that the despoliation of the Gulf and of the Louisiana coast has been going on for decades. Syrian dictator Bashar al-Assad told Saudi King Abdullah during their meeting in Damascus Friday that the UN tribunal investigating the 2005 assassination of Lebanese prime minister Rafik Hariri must be closed to protect Lebanon's stability, AFP cited from a report in Lebanese newspaper Al-Akhbar on Saturday. Assad made clear to Abdullah - a key supporter of the faction of Sa'ad Hariri, son of the former premier and current prime minister - that Syria would find any attempt to hold Hizbullah accountable for the elder Hariri's death as unacceptable. The UN Special Tribunal for Lebanon is reportedly set to announce that Mustafa Badr al-Din, a senior Hizbullah operative and close relative of the former Hizbullah terror chief Imad Mughniyeh, is the main suspect in the Hariri assassination. According to an Israel TV report on Thursday night, Hariri’s son, the current Lebanese Prime Minister Saad Hariri, asked the tribunal to postpone releasing Din’s name, because of the potentially incendiary implications for Lebanon of such an announcement. Din, the cousin and brother- in-law of Mughniyeh, who was killed in a car bomb in Damascus in February 2008, was also reportedly responsible for planning the attempted assassination of the ruler of Kuwait in 1985, among other operations. A statue for Helen Thomas??? What next? A statue for Louis Farrakhan??? On Tuesday, the museum started a 45-day campaign to raise the remaining $10,000 for the roughly $30,000 statue. Some in the Jewish community are wary of honoring Thomas. "I just hope that the support for this memorial is there despite her anti-Israel and anti-Semitic views and not because of them," said Richard Nodel, president of the Jewish Community Relations Council. Anan Ameri, director of the museum, said she disagrees with her comments, but Thomas "spent her life ... doing a lot of good things." COLOMBIA'S PRESENTATION to the Organization of American States about Venezuela's hosting of the FARC terrorist movement prompted a flurry of speculation about the motives of Álvaro Uribe, Colombia's outgoing president. Why, it was asked, did he want to end his eight years in office in another confrontation with Venezuelan strongman Hugo Chávez? Could he be trying to sabotage his successor, Juan Manuel Santos, who is due to take office on Aug. 7? Allow us to offer a simple explanation: Mr. Uribe, who has devoted his presidency to rescuing Colombia from armed gangs of both the left and the right, is deeply frustrated by Venezuela's continuing support for the FARC -- and by the failure of the international community to hold Mr. Chávez accountable for it. Before leaving office, Mr. Uribe felt compelled to make one more effort to call attention to a problem that, were it occurring in the Middle East, would surely be before the U.N. Security Council. That Venezuela is backing a terrorist movement against a neighboring democratic government has been beyond dispute since at least 2008, when Colombia recovered laptops from a FARC camp in Ecuador containing extensive documentation of Mr. Chávez's political and material support. Colombia's presentation to the OAS last week contained fresher and more detailed intelligence. Ambassador Luis Alfonso Hoyos supplied precise map coordinates for several of the 75 FARC camps that he said had been established on Venezuelan territory and that harbor some 1,500 militants. He showed photos and videos, including one of a top commander from another Colombian terrorist organization, ELN, sipping Venezuelan beer on a popular Venezuelan beach. Mr. Chávez responded with predictable bluster, breaking off relations with Bogota and threatening (not for the first time) to cease oil exports to the United States. Another crisis with Colombia probably benefits the caudillo, who is desperate to distract attention from his country's imploding economy and soaring violence. Nevertheless, the question remains: Will other democracies support Colombia against this flagrant violation of international law? The Obama administration is characteristically lukewarm. The State Department, which has designated the FARC a terrorist organization, said it found Colombia's allegations "persuasive" but limited itself to supporting "a transparent international process" to investigate them. Perhaps more consequentially, one of the leading candidates in Brazil's presidential election campaign, José Serra, said "it is undeniable that Chávez is sheltering these FARC" militants. Under outgoing president Luiz Inácio Lula da Silva, Brazil has been one of Mr. Chávez's chief apologists and enablers. Were that support to be withdrawn, Mr. Chávez might have to rethink his terrorist alliance. Despite the upcoming congressional elections November, Jewish Democrats and Republicans found themselves awkwardly united this week, following the embarrassing public relations lapse of Democratic congressman Mike McMahon's reelection campaign, whose staff released on Thursday a list of 80 Jewish donors who contributed to the campaign of his Republican rival, Mike Grimm. The point was to show that Grimm’s campaign money doesn’t come from his district - but not surprisingly, the “Jewish money” became the main point of discussion. “This is a United States congressman that's segregating people out by their religion,” concluded Grimm. In an attempt to minimize the damage, McMahon’s communications director Jennifer Nelson - who was quoted by the New York Observer as saying: “There is a lot of Jewish money, a lot of money from people in Florida and Manhattan, retirees." - was fired. McMahon, who represents New York's 13th district, repudiated Nelson's comments saying they were “entirely inappropriate” and “unauthorized”, and added that he was “outraged” by them. For the Jewish Republicans, however, it wasn’t the end of the story. "Congressman McMahon has fired his communications director, but what about the other staff involved? Who asked for that list to be compiled? Who approved that action? Congressman McMahon needs to do more than apologize for 'inappropriate comments' - he must be held accountable for actions that his campaign staff took to count Jews supporting his rival," Brooks said. “I don't think this is something that should be swept under the rug. Seeing such bigotry from a sitting congressman's campaign is deeply troubling." An Iranian official says cigarettes smuggled into Iran have been tainted with pig blood and nuclear material as part of a Western conspiracy. The semiofficial Mehr news agency quotes Mohammad Reza Madani from the Society for Fighting Smoking as saying contraband Marlboros have been contaminated with pig hemoglobin and unspecified nuclear material. Madani claims Philip Morris International, which sells Marlboro outside the US, is "led by Zionists" and deliberately exports tainted cigarettes. Why don't we hear from Afghans??? Aisha is an 18-year-old Afghan woman whose nose and ears were cut off by a Taliban butcher for the "crime" of running away from the beatings she routinely suffered at the hands of her husband's family. Aisha's picture appears on the cover of Time magazine this week, provoking controversy. Lost in all the self-serving and cowardly Code Pinkish yesbuttery and the handwringing about the propriety of a major magazine running a photograph so shocking - can we not at least stop for a moment to notice that Aisha, in the full flower of womanhood, is unspeakably beautiful in spite of her disfigurement? - is that fact that she wants the world to see her face. By her own account, she wants the world to see what the Taliban's resurgence means to Afghan women, and to see the obvious implications of the "negotiated" solution to the Afghan struggle that is so de rigueur in bourgeois-left circles in the rich countries of the world. In her essay on the struggle of Afghan women, Time magazine's Aryn Baker reports the question Aisha raises: Talk that the Afghan government is considering some kind of political accommodation with the Taliban frightens her. "They are the people that did this to me," she says, touching her damaged face. "How can we reconcile with them?" What is especially striking about this event is that for once, an Afghan opinion, and that of an Afghan woman, no less, has actually appeared not only as the focus of an article about Afghanistan in a major English-language periodical, but on its cover. I keep yearning for a day when I can turn on the TV, switch to CNN, FOX, MSNBC or CBS and see a discussion about Afghans where they actually question an Afghan. Day after day I wait, but in vain. I run through articles published about my country in the Washington Post and the New York Times to see opinion pieces written by Afghans -- but almost never see one.
. . . At a time when your media was supposed to tell you that your blood and sacrifice has indeed helped Afghanistan and that we are thankful to you, they told you otherwise. We don't like you -- they say -- and don't want your help. We are ungrateful devoted murderers who are just dying to kill you -- they warn. Our picture has been so skewed that you won't even recognize us if we walked amongst you. I won't be surprised if you think that we have fangs and blood dripping from our mouths and are just waiting to bite your jugular. This is who we are to you. It is comforting to know that Aisha is now in a secure location in Afghanistan, with armed guards watching over her, thanks to Women for Afghan Women. Aisha will soon visit America for reconstructive surgery at the Grossman Burn Foundation. Time magazine is pitching in to help her. Not so fortunate, in the matter of the concurrent media hubbub arising from WikiLeaks' recent sticking-it-to-the-man document dump, are the uncounted ordinary Afghans whose exposure to reprisals and terror has been so disgracefully overlooked in all the crawthumping about the implications for "our" security interests and "our" troops in the WikiLeaks affair. Once again, a round of applause to the self-congratulating WikiLeaks archgeek Julian Assange. The Times reports that after just two hours of combing through the WikiLeaks documents it was able to find the names of dozens of Afghans said to have provided detailed intelligence to US forces - Afghans the Taliban and Al-Qaeda should be expected to be targeting in the war zone by now. "If I were a Taliban operative with access to a computer — and lots of them have access to computers — I’d start searching the WikiLeaks data for incident reports near my area of operation to see if I recognized anyone," writes Joshua Foust. "And then I’d kill whomever I could identify. Those deaths would be directly attributable to WikiLeaks." In conversation with Spencer Ackerman, Foust reports that, against WikiLeaks' claims of diligence, he found several identities of Afghans disclosed by the WikiLeaks documents - unredacted, full names, where they live, and so on - and those identities are now available to Taliban butchers. "I found myself shocked that WikiLeaks would be that cavalier with Afghan lives." I am not shocked, I regret to say. But I am as disgusted as my comrade Brian Platt is - read his post here and if you have a shred of decency in you, you will be disgusted by the WikiLeaks' operation, too. And by the way, if you think anything really "new" was revealed by the vandals at WikiLeaks, here's another article by Josh Shahryar. It appeared in the Kabul Weekly, five years ago. THE CAUSES of Jordan’s recent line of official hostility toward Israel are deep-rooted in the makeup of the Jordanian state itself. Jordan is a country with a Palestinian majority which allows them little or no involvement in any political or executive bodies or parliament. This lack of political and legislative representation of Jordanians of Palestinian heritage has been enforced by decades of systematic exclusion in all aspects of life expanding into their disenfranchisement in education, employment, housing, state benefits and even business potential, all developing into an existing apartheid no different than that formerly adopted in South Africa, except for the official acknowledgement of it. The well-established apartheid system has created substantial advantages for East Bankers who dominate all senior government and military jobs, along with tight control of security agencies, particularly the influential Jordanian General Intelligence Department, all resulting in tribal Jordanians gaining superiority over their fellow citizens of Palestinian heritage. The fact that East Bankers have done very well under the current situation provides motive for Jordanian officials to maintain the status quo and work on extending it; especially as the helpless Palestinian majority has no say and very little it can do against such conditions. The East Bankers’ desire to keep their privileges has gone unchallenged until recent years, when the international community mentoring the peace process has brought into its dynamics one of Jordan’s most critical commitments of the peace treaty with Israel, by which Jordan is obligated to negotiate the conditions of the displaced individuals from both sides. When Jordanians of Palestinian heritage moved to Jordan in 1967, they were Jordanian citizens legally relocating inside their own country as Jordan had declared the West Bank a part of the Hashemite kingdom 19 years earlier. Therefore, the Palestinians’ move to Jordan was similar to an American’s move from New York to New Jersey. This fact was hard to absorb by the Jordanian government, as it dictates that citizens of Palestinian heritage are equal to them in rights and therefore entitled to political representation. Such concept would have shaken the privileged ruling elite and has been confronted by a dramatic rise in radical nationalism among East Bankers and extensive support of the apartheid policies of the government that pushes Palestinians to believe they should return to “Palestine” as their home country. Since 2008, East Bankers have been embracing hostility toward Israel with dedication to “liberating Palestine” as an excuse to further exclude the Jordanians of Palestinian heritage with calls for a universal denaturalization to put pressure on Israel. Such calls have been emphasized and publicized by the media, which are tightly controlled by Jordanian intelligence. The radical nationalists went as far as aligning themselves with Islamists to defend their cause, as both call for turning Jordanians of Palestinian heritage into refugees rather than citizens. The anti-Palestinian/anti-Israeli conservative nationalist political salons in Amman have been calling for threatening Israel with what they describe as the Palestinian demographic bomb by sending the Palestinians to Israel. The Jordanian state seems to subscribe to this idea through sustaining the on-going process of striping Palestinians in Jordan of their citizenships. Although it has been done to a few thousand, it is viewed as a victory for radical nationalists. This trend poses a serious threat to regional stability and Israeli national security. Earlier this year, another pathbreaking work of historical scholarship appeared that, if facts mattered at all in this debate, would put the final nail in the coffin of the Nakba myth. The book is Palestine Betrayed, by Efraim Karsh, head of the Middle East program at King’s College London. Karsh has delved deeper into the British and Israeli archives—and some Arab ones—than any previous historian of the period. He deftly uses this new material to seal the case that the Nakba was, to a large extent, brought on by the Palestinians’ own leaders. In describing the battle for Jaffa, the Arab city adjoining Tel Aviv, Karsh uses British military archives to show that the Israelis again promised the Arabs that they could stay if they laid down their arms. But the mufti’s orders again forbade it. In retrospect, it is clear that the mufti wanted the Arabs of Haifa and Jaffa to leave because he feared not that they would be in danger but that their remaining would provide greater legitimacy to the fledgling Jewish state. Nor will the facts about 1948 impress the European and American leftists who are part of the international Nakba coalition. The Nakba narrative of Zionism as a movement of white colonial oppressors victimizing innocent Palestinians is strengthened by radical modes of thought now dominant in the Western academy. Postmodernists and postcolonialists have adapted Henry Ford’s adage that “history is bunk” to their own political purposes. According to the radical professors, there is no factual or empirical history that we can trust—only competing “narratives.” For example, there is the dominant establishment narrative of American history, and then there is the counter-narrative, written by professors like the late Howard Zinn, which speaks for neglected and forgotten Americans. Just so, the Palestinian counter-narrative of the Nakba can now replace the old, discredited Zionist narrative, regardless of actual historical facts. And thanks to what the French writer Pascal Bruckner has called the Western intelligentsia’s new “tyranny of guilt”—a self-effacement that forbids critical inquiry into the historical narratives of those national movements granted the sanctified status of “oppressed”—the Nakba narrative cannot even be challenged. This makes for a significant subculture in the West devoted to the delegitimization of Israel and the Zionist idea. To leftists, for whom Israel is now permanently on trial, Stone’s 1948 love song to Zionism has conveniently been disappeared, just as Trotsky was once disappeared by the Soviet Union and its Western supporters (of whom, let us not forget, Stone was one). Thus Tony Judt can write in The New York Review of Books—the same prestigious journal in which Stone began publishing his reconsiderations of Zionism—that Israel is, after all, just an “anachronism” and a historical blunder. Several years ago, I briefly visited the largest refugee camp in the West Bank: Balata, inside the city of Nablus. Many of the camp’s approximately 20,000 residents are the children, grandchildren, and even great-grandchildren of the Arab citizens of Jaffa who fled their homes in early 1948. For half a century, the United Nations has administered Balata as a quasi-apartheid welfare ghetto. The Palestinian Authority does not consider the residents of Balata citizens of Palestine; they do not vote on municipal issues, and they receive no PA funding for roads or sanitation. The refugee children—though after 60 years, calling young children “refugees” is absurd—go to separate schools run by UNRWA, the UN’s refugee-relief agency. The “refugees” are crammed into an area of approximately one square kilometer, and municipal officials prohibit them from building outside the camp’s official boundaries, making living conditions ever more cramped as the camp’s population grows. In a building called the Jaffa Cultural Center—financed by the UN, which means our tax dollars—Balata’s young people are undoubtedly nurtured on the myth that someday soon they will return in triumph to their ancestors’ homes by the Mediterranean Sea. In Balata, history has come full circle. During the 1948 war, Palestinian leaders like Haj Amin al-Husseini insisted that the Arab citizens of Haifa and Jaffa had to leave, lest they help legitimize the Jewish state. Now, the descendants of those citizens are locked up in places like Balata and prohibited from resettling in the Palestinian-administered West Bank—again, lest they help legitimize the Jewish state, this time by removing the Palestinians’ chief complaint. Yet there is a certain perverse logic at work here. For if Israel and the Palestinians ever managed to hammer out the draft of a peace treaty, Mahmoud Abbas, president of the Palestinian Authority, would have to go to Balata and explain to its residents that their leaders have been lying to them for 60 years and that they are not going back to Jaffa. Which, to state the obvious again, is one of the main reasons that there has been no peace treaty. The depiction required a certain leap of imagination. In the six months leading up to his April 2009 arrest, Yadegari had contacted 118 companies across North America and sent more than 2,000 emails to suppliers in hopes of getting his hands on parts used in the enrichment of uranium for nuclear fuel. Several firms warned him that his activities ran afoul of international law, while his “handler” in Tehran—a man named Nima Tabari— instructed him on how best to avoid attracting the attention of authorities. Yet the hapless Torontonian pressed on, and in March 2009 was caught trying to ship devices called pressure transducers to Iran via the United Arab Emirates. He now faces up to 10 years in prison. High on Tabari’s shopping list were pressure transducers, instruments that translate pressure measurements into electronic signals that can be displayed and recorded on a computer. Though widely available for use in everything from oil refineries to medical labs, the devices are on the UN’s list because they are a key component in centrifuges. Yadegari’s conviction stemmed from his purchase of 10 transducers from a company based in Markham, Ont., two of which he tried to send to Iran by way of Dubai. What seems increasingly clear now is that the Yadegari case was no one-off. Through online inquiries, and interviews with authorities in both Canada and the U.S., Maclean’s has established not only that Tabari is still in business, but that he is linked to other suspected nuclear traffickers. Speaking on condition of anonymity, one law enforcement source said TSI is believed to be a front firm for the Kalaye Electric Company, an arm of the state-controlled Atomic Energy Organization of Iran, which appears on a UN Security Council list of entities involved in Iran’s nuclear proliferation activities. According to the security council and numerous NGOs, the company has acted as procurer for fuel enrichment sites, including a formerly secret facility in Natanz that first came to light in 2002. A rocket fired from the northern Gaza Strip town of Beit Hanoun exploded in the heart of a populated area in the southern city of Ashkelon on Friday morning. Eight people suffered shock. Two empty floors of an apartment building, several cars and a nearby pavement sustained damage. Many windows were shattered. Police dispatched to the rocket's landing site urged the residents to stay in their homes for fear of additional rockets. "We heard the siren and ran into the fortified room," says Dudi Ben-Shlush, who lives on the fourth floor of the building hit by the rocket. "We heard the loud explosion only after we came out. The entire building trembled, windows were shattered, and the shutters were damaged. "When we went downstairs, we saw that our two cars were completely damaged and their windows were shattered. It was very scary; we thought the entire building was going to collapse." Nechama Carmi, who lives in the same building, was washing her car when she heard the siren. "I ran into the stairwell and waited there. When I came out I heard the loudest explosion I've heard since Operation Cast Lead. It was very strong and terrifying." German judge Christian Tomuschat is facing increased pressure to step down as head of the UN panel charged with reviewing the implementation of the Goldstone report's demands. Critics say Mr Tomuschat has already likened Israel's self-defence actions to "state terrorism", and thus cannot provide an unbiased assessment of whether Israel and Hamas have properly investigated and then tried those alleged to have committed war crimes during Operation Cast Lead. Mr Tomuschat, professor emeritus at Humboldt University, Berlin, was named this summer as head of the panel, which is to submit its report in October. The other members of the committee are attorney and special UN rapporteur Param Cumaraswamy of Malaysia and former New York State Supreme Court Justice Mary McGowan Davis. At issue are Mr Tomuschat's past statements on the Israeli-Palestinian conflict. In a 2002 essay on responses to terrorism, he wrote - commenting on Israel's military response to terrorist attacks - that a state that orders retaliation against "presumed terrorists" knowing civilians might be killed "deserve[s] the same blame as those targeted by them". He also expressed doubt that such a state's judicial system could "conduct effective investigations and punish the responsible agents". Speaking to the Jerusalem Post last weekend, Mr Tomuschat insisted that his past statements have been objective and ridiculed the suggestion that he resign from the panel. But Hillel Neuer, director of the Geneva-based NGO, UNWatch, said that he should indeed step down. "A panel tasked with assessing the effectiveness of Israel's war crimes investigations, headed by someone who has already made up his mind and declared himself on this precise question - against Israel - is not only absurd but a travesty of justice." The appointment of an open critic of Israel is further evidence, he said, of an anti-Israel bias on the UN Human Rights Council, which includes as members states that are dictatorships, are implicated in genocide or otherwise have shady records on human rights. "Even if it were Mother Therea and Mahatma Ghandi on the committee, the entire process would be tainted by bias," Mr Neuer said. Recently the former foreign minister of Iceland, Ingibjorg Solrun Gisladottir, was removed from the UNHRC committee of inquiry into Israel's conduct in the ill-fated flotilla raid in May, after she was found to have signed a petition supporting the flotilla. In his 2002 essay, Mr Tomaschut also suggested that the victim of a terror attack might be to blame for his own suffering: "Any state under terrorist attack should "analyse its own conduct and ask itself whether it has made mistakes which have given rise to frustration, hatred and despair." And, how many years would a man have gotten in prison for this???? A Calgary mother will not serve any jail time for strangling her teenage daughter, a judge rules. Aset Magomadova, who was convicted last fall of manslaughter, was instead given a suspended sentence and three years of probation. Magomadova used a scarf to kill her troubled daughter, Aminat, 14, after a violent struggle in their southeast Calgary home in 2007. The mother was acquitted of the original second-degree murder charge. Crown prosecutor Mac Vomberg had asked the Court of Queen's Bench for a 12-year sentence, arguing that Magomadova abused her position of trust and authority and that her actions needed to be strongly condemned. But Justice Sal LoVecchio, reading from his 25-page decision, said: "Showing mercy does not mean we approve of the act. It simply means sometimes a particular situation may demand a slightly different solution. Muslims often accuse Jews of harassing and plotting against Muhammad, Islam's founder and prophet, a charge abundantly clear since the start of classic Islamic writings, which are filled with anti-Jewish imagery. In our "post-modern" age, most Western scholars, who are secular, find it difficult to accept the idea that medieval texts can dictate the lives of, or even inspire, people today. They criticize those who see the conflict as religious, arguing that scholars who see the conflict as religious, place too much emphasis on these ancient texts, as both the times and circumstances have changed. For them, these texts are outdated. In short, secular scholars find it difficult to believe that people even still regard religious ideas as relevant. In talking with the common people in the Arab and Muslim world, however, it becomes clear that for them, these classical texts are as relevant today as when they were written. For the overwhelmingly majority of Muslims, these texts indicate that the conflict is indeed religious, not territorial. As Muslims view the world, Muhammad was the ideal Muslim. How he acted is how all Muslims should act. So how Muhammad acted towards the Jews in Medina and Khaybar is how Muslims should act towards Jews. How, then, did Muhammad act? In 622 CE, Muhammad asked the Jews to recognize him as a prophet and join Islam. When they refused, he turned against them. After Muhammad became stronger in Medina, he instructed the Muslims to terrorize the Jews. Muhammad's first victim was Ka'ab bin al-Ashraf, the leader of one of the three Jewish tribes in Medina. After the Muslims decapitated him, they brought his head to Muhammad who took it and said, "Praise G-d for the death of Ka'ab." (Source: Kitab al-Maghazi [The Book of Muslim Raids Against the non-Muslims], Vol. 1, pages 184-190). Immediately thereafter, Muslim tradition talks about the murder of the Jewish trader ibn Sunayna by the Muslim, Muhaysa bin Mas'ud. When Muhaysa's brother Huwaysa, heard about the murder, Huwaysa beat his brother mercilessly and said to him: "Much of the fat in your stomach is due the man (i.e., the Jew) you just murdered." Muhaysa responded, "If the one who commanded me (i.e., Muhammad) to slaughter ibn Sunayna would ask me to kill you – my own brother – I would do so." His brother responded, "a religion that can make a brother kill his own brother is a wonderful/amazing religion." Huwaysa immediately converted to Islam. (Source: Kitab al-Maghazi, Vol. 1, pages 190-192). Simultaneously, the Muslims murdered many more Jews in the back alleys of Medina. In 624, when the Muslims besieged another Jewish tribe in Medina, the Jews gave up. Muhammad wanted to execute them, but one of the powerful non-Muslim allies of the Jews prevented Muhammad from doing so. Muhammad gave in, but exiled the Jews and expropriated their property and agricultural lands. A year later, Muhammad did the same thing to another Medinan Jewish tribe. (Source: Kitab al-Maghazi, Vol. 1, pages 176-180 & pages 363-380). In 627, Muhammad besieged the last Jewish tribe in Medina. Their powerful non-Muslim ally had by that time died; the Jews had no one to protect them. The Jews then sent a messenger to Muhammad and expressed their willingness to surrender and leave the city. Muhammad said no and told them that if they agreed to surrender, he would appoint a negotiator who would settle the issue. When the Jews agreed. the negotiator Muhammad appointed was the man who had organized the murder of the above-mentioned Ka'ab, and who passionately hated the Jews. He decided that the Jewish men would be executed, and that their women and children would be distributed among the Muslims. About 750 Jews were then murdered in the marketplace in Medina, and heaped into a common grave. Muslim tradition teaches that Jewish blood flowed like a river through the market. (Source: Kitab al-Maghazi, Vol. 2, pages 496-520). Interestingly, this image has been used over and over again throughout Muslim history. In 2004, for example, when Nick Berg, an American Jew working in Iraq, was kidnapped and then murdered by the Iraqi al-Qaida leader al-Zarqawi, as Zarqawi was about to behead Berg, he said: "I will do to you what Muhammad did to the Jews in Medina." In 628, Muhammad besieged the Jewish city Khaybar. Before doing so, he sent in assassins to murder the Jewish leaders of the city, thereby terrifying the rest of the people. A bloody battle ensued; the Jews surrendered. Muhammad imposed on them the Jizya tax [for non-Muslims], and they thus became "dhimmis" [officially second-class citizens]. Muhammed also demanded that the Jews turn over to the Muslims half of their crops (note: the Muslims did not know how to raise crops). On the day that the Jews of Khaybar surrendered, Muhammad married to Jewish wife of the leader of the city, whose father Muhammad had previously killed. At the same time, her husband was tortured to death so he would tell the Muslims where he had hidden his treasure. (Source: Kitab al-Maghazi, Vol. 2, pages 440-479). The victory against the Jews in Khaybar is deeply etched in the Muslim historical memory; it has become a source for mockery of the Jews so much so that it is constantly invoked at every opportunity when discussing the Arab-Israeli conflict. It is very common to hear Palestinians, when demonstrating against Israel, shout "Khaybar Khaybar Ya Yahud Jaish Muhammad sa-Ya'ud, (Khaybar Khaybar, Oh Jews, Muhammad's army shall return!") -- as the Turkish terrorists on board the Flotilla headed towards Gaza shouted just a few months ago. There is also another version of this slogan - "Khaybar Khaybar Ya Yahud, ila Falastin na'ud, (Khaybar Khaybar, Oh Jews, We Shall Return to Palestine). In this context, the message is to return to "all of Palestine," including Israel's pre-1967 borders, as can been seen on virtually every Palestinian and Arab map. The Muslim victory at Khaybar also serves as an inspiration for Hizbullah, the Shiite terrorist organization. Its spokesmen constantly invoke the imagery of Khaybar regarding their struggle against Israel, for example, calling the Fajar 5 rockets they fired at Israel during the 2006 Lebanon War "Khaybar Rockets;" and in 2002, the Iranians developed a rifle they named "Khaybar 2002." Among the Palestinians, it is now an essential and integral part of the education system throughout most of the Muslim world, most notably in the West Bank, the Gaza Strip, and among Israel's Arabs as well. Jordan's Islamist-led trade unions on Wednesday strongly condemned Israeli Prime Minister Benjamin Netanyahu's visit to Jordan, describing him as a "criminal." "At a time when the Zionist enemy is killing our people in Palestine and destroying their homes, as well as planning schemes against Jordan's security, officials receive Netanyahu the criminal in Amman," head of the unions' council Ahmad Armuti said in a statement. "The trade unions completely reject this visit and hold the government responsible for its political and public responsibilities, in line with the constitution." A new department set up by Ministry of Pensioners Affairs to manage the legal claims of Israeli Jews of Middle Eastern descent who lost their property when they left countries throughout the region has begun collecting information. The office will help identify, locate and seek compensation for the assets of the more than one million Jews who came to Israel from Iran, Iraq, Morocco, Algeria, Tunisia, Egypt, Iraq, Yemen, Lebanon and Syria. The initiative follows a law approved earlier this year by the Knesset requiring the compensation of Jews from Arab countries and Iran to be included in any peace negotiations. “The Palestinians have been collecting evidence of their losses for many years,” said Yoni Itzhak, a spokesman for the Pensioners Affairs Ministry. The ministry says that as of 2007 “the estimated value of Jewish property in Arab countries is 50 percent more than the value of the property of Palestinian refugees and is valued at billions of dollars.” The ministry did not provide specific figures. Following the establishment of the state, most Muslim states declared or supported war against Israel, and the status of Jews in these countries became threatened. According to estimates by the United Nations and a number of civil society organizations, during Israel’s first decade about 265,000 Jews left Morocco, 140,000 left Algeria, 135,000 left Iraq, 120,000 left Iran, 103,000 left Tunisia, 75,000 left Egypt, 63,000 left what is now Yemen, 38,000 left Libya, 30,000 left Syria and 5,000 left Lebanon. More than half a million additional Jews have left these countries since. Most of the emigres headed to Israel, and just a few thousand Jews remain in the Arab world today. Horrors...could you imagine - Arab writers actually might meet an Israeli??? A writers’ conference at a public university in southern France was canceled after some Arab participants refused to attend because of the presence of Israeli author Esther Orner. The meeting at the Université de Provence Aix/Marseille was intended to feature Mediterranean authors. “The story beneath all this – and it’s an enigma – is that nobody knows the names of the Arab writers” who refused to dialogue, Orner told JTA. Jean-Raymond Fanlo, a Spanish Literature professor at the university, told French media that one of the Arab authors who boycotted Orner’s presence was “a major writer around which we will organize a vast program in Marseille schools for back to school.” Fanlo refused to divulge the author’s name for fear of adding controversy. As a result of the Arab refusal, the university said in a statement that it was forced to cancel the whole seminar. A facebook page advertising a 'spa' at Nazi death camp Auschwitz has been removed by the social-networking site following a complaint from Jewish human rights organization The Wiesenthal Center. From his home in Beersheba, Yahya Marhabi still misses his hometown of Sana'a, Yemen. He left it nine years ago, but it is not the neighbors he misses, nor is it the air of constant fear. Marhabi misses his sister, Lea (18), who disappeared several months ago. Marhabi claims she was abducted, forced to convert to Islam and marry a Muslim. Some six weeks ago, he returned to Yemen to look for Lea, and saw firsthand how Jews were living in a country where al-Qaeda cells roam free. Marhabi's concern for the Jewish community in Yemen, including his parents and brother who still live in Sana'a, does not give him a moment's rest. Lea, he said, was abducted from the Jewish quarter by Muslims, probably members of al-Qaeda. "She was abducted just two weeks after marrying one of the Jewish men of the congregation. She was forced to convert to Islam and marry one of her abductors," he said. Lea's Jewish husband, he continued, has since remarried, realizing chances of her return were slim. Marhabi, however, has vowed to find his sister. "This was a hard blow for us. Not a day goes by that I don't think of her, try to figure out a way to help her, to bring her home," he said. "If I were there at the time of her abduction I would have done everything to bring her back, but it's not that simple now. There is little we can do – but we are doing it." Arab media paint a different picture: According to reports in the Palestinian News Agency, Lea eloped with a young Muslim man by the name of Aaron Salam, converted of her own free will and kept in touch with her family – at least long enough to make it clear she had no desire to come home. The reports claim that the wedding was celebrated by the local elite, with dignitaries such as the president of Yemen, the deputy prime minister and other high ranking officials attending the ceremony. The report further alleged that the young couple eloped after the Marhabi family rejected the young man's offer of marriage. "They made it look like she went willingly rather then she was abducted," Marhabi said, "But we know she was kidnapped and we pray that she comes back to us, by some miracle." After four weeks of searching to no avail Marhabi returned to Israel. The Sana'a he left nine years ago, he said, is not the one he found, or even the one he remembered from his previous visit. Today, he said, the story of the Jewish community in Yemen is one of a few hundred Jews, trying to survive amid a Muslim majority. The Jews currently living in the Yemenite capital essentially live in a ghetto; and in constant fear of violence, abduction and murder. Al-Qaeda's grip on Yemen has grown considerably over the past few years. "The real change began a year ago, when the brother of the head of the Jewish community was murdered," said Marhabi. The act prompted the president to order a well defined, closed off area be set for Jews in Sana'a. "Life there is very hard. They barely leave the area. They have no freedom, they don't work and they are afraid of coming into contact with the Arab population. Only the men leave the area, and only in broad daylight, and usually only to go to the market. They also make sure to disguise all their Jewish markings, like skullcaps. If they are recognized as Jews, they are spat and cursed at." The volatile situation, he added, even had Yemeni President Ali Abdullah Saleh order armed troops to guard the Jewish quarter of Sana'a. "He made a personal trip to the area to reassure them, that they would be protected. "He really doesn’t want any harm to come to any of them. He even gives them money, since they don't work," he said. Jewish life in Sana'a is clouded by fear and uncertainty, said Marhabi. "There is no joy there. People there have no light in their eyes. They are very lonely – 185 Jews amid a huge Arab nation. There used to be such joy there. Contentment, despite the hardship. Now there is just fear. Al-Qaeda wants to eradicate the Jews." Some 18 families came to Israel from Yemen in recent months. Jews find it hard to leave despite the hardships, and Israel is currently trying to convince the remaining Jews to leave. "There are several issues with coming to Israel," said Marhabi. "First, it's not easy to leave one's homeland. It's also a different world there, altogether. "They are also afraid to leave, because they are afraid they will be left with nothing. The Arabs won't buy their property because they know it's only a matter of time before they leave Yemen anyway, leaving it behind for the taking." Is Al-Qaeda developing biological weapons??? Were 40 terrorists killed at a training camp in Algeria??? Take the protest march on behalf of Gilad Shalit last month. Tens of thousands of Israelis took to the roads, tens of thousands stood by roadsides feeding the marchers, and millions watched the marchers on Israeli TV. I have not seen any of it on CNN, for it was aimed inward, toward the Israeli government. We would have surely seen some of it had this enormous energy been directed outward, say, as a protest against the United Nations or the Red Cross or foreign embassies for not doing their share in stopping the most blatant human rights violation of our generation. Beinart was treated royally in Los Angeles because he is the prophetic voice for many Jews of Discomfort; they love him because he takes their discomfort and elevates it to a noble feeling of moral purity. They used to feel guilty for Israel’s actions while conscious of her problems; no more. Elevated in virtue, they now see every blemish on Israel’s face as “the litmus test” for her impure personality — hers, not theirs. Observe another Jewish intellectual, the French philosopher Bernard-Henri Levy, who is perhaps further to the left than Beinart. He, too, feels uncomfortable with some of Israel’s actions, and he, too, proposed ways to correct them. Yet instead of pointing fingers at the Jewish establishment, he takes to the trenches and, using his column on The Huffington Post, he tells his leftist colleagues: Stop this madness, look at yourself in the mirror. Is your liberalism dead when it comes to Israel? (June 7, Huffington Post). It is all a matter of surface-to-weight ratio, says my physics book: Jews of spine confront their maligners, Jews of Discomfort blame their leaders. Deep inside, Levy knows, perhaps, that ours may well be the last generation in which Jews can earn respect in academic and intellectual circles; pro-coexistence scholars are already pariahs in academia, forced to hide their sentiments from colleagues. (See my column in this newspaper, “Our New Marranos,” March 19, 2009), and if Israel goes under, Jews of Discomfort will certainly find themselves exorcised by the elite they now seek to appease. They would be remembered not for their discomfort, but for what they really were: members of a people who once supported a mistake called Israel — ruling elites do not easily forgive “mistakes” they labored to undo. Hate mail from a UNRWA email address arrived in my in-box today. I'm omitting the first half of the email address so this person doesn't get bombarded with emails. Dishonest reporting, That’s your true identity, and your true character. Thank God that many people; including Jews, all over the world even inside Israel, whom you like to call self hating Jews; have started to see the big lies of Zionists including yours. I wonder how many truly of those around. If you really want to be fair and honest about it, which I doubt, go back and read history with a fair and nonbiased mind. I did some Googling, and found on LinkedIn a Saadi Rahim who works for the UNRWA -- as an officer in charge of transportation and logistics in Jordan. What unstated big lies of the Zionists (and HonestReporting) is Mr. Saadi Rahim referring to? These? • What Else is the UNRWA Not Telling Us? More importantly, by using a UNRWA email address, he may technically be representing the UNRWA. Do Rahim's views of Zionism represent the UNRWA? What does this say about the organization Rahim works for? Even if Rahim's views don't technically represent the UNRWA, he did use an official email address the same way Octavia Nasr had CNN written all over her tweet. More Danish Jews are seeing the discontent and hatred of some people against acts by the state of Israel transferred to them as individuals, when they sport their Jewish identity. For fear of ending up in a conflict or worse - of being attacked - more Danish Jews are removing clothing or jewelry that can reveal their Jewish affiliation. This is confirmed by the Mosaic Faith Society, which in its incident reports saw a drop of antisemitic incidents in the past year. "Several times I've advised against wearing kippah or anything else - for example, in Nørrebro, because experience tells us that it can lead to unpleasant experiences." And there are probably more who keep it hidden, says the chairman of the Mosaic Faith-Society, Finn Schwarz. One of those is 32 year old Peter Kaltoft from Amager, who today keeps his kippah on the shelf. He takes it out only on special events, or when he's in the synagogue on Krystalgade (Krystal avenue) in Copenhagen. "When I wear my kippah, I don't only symbolize Judaism, but apparently also Israel, and that can be offensive for some people," he says. Danish Jews are more vigilant when the conflict between Israel and Palestine flares up. The last time you could see this was when an 18 year old man was attacked on May 1st in Fælledparken in Copenhagen, because he said he was a Jew. "There is no doubt a link between what happens in Israel-Palestine and what goes on in Denmark. When the conflict is sparked in the Middle East, the same happens at home," says Finn Schwarz, who has found that Jews all over the world are held responsible for the civilian losses that follow in the wake of the fighting between the Israeli army and the Palestinians. Peter Kaltoft had been subjected to various scenarios. "The most common is nasty harassment, where I'm spitted and shouted at." He says it also happens that they drive behind him slowly in their cars, while they hurl abuse out the window. He was accosted several times during the month, until almost a year ago he decided to be more careful with his faith and head covering. Peter Kaltoft remembers in particular an episode from a year and a half ago, when he was on his way home from the synagogue in Nørreport. "I went home alone after I had been in the synagogue, when several Middle Eastern men came towards me. They were very agitated, yelled a lot of unpleasant curses and slowly moved closer and closer. First they asked if I was a Jew, to which I answered that I was, and then they began to beat and push, until I was able to run away," says Peter Kaltoft, who since the attack rarely shows his kippah or Star of David in public. "It's isn't just a decision I've taken for myself, but also for the sake of those I go with. They shouldn't be attacked or harassed because I'm wearing a kippah," says Peter Kaltoft. 30 year old Søren from Roskilde can nod with identification to the fear and aggravating episodes. Nearly two years ago he was attacked by 3-4 Middle Eastern men in a club in Nørrebro. They felt provoked by a Star of David which he had as a pendant on his necklace. For almost two years, Søren was a customer in the club without any problems, but at one time there was again battled between the Israelis and Palestinians in Gaza, and the incitements to hate and murder of Jews flourished in the streets. "They say that I had a Star of David on my neck and they came over and asked if I was Israeli. I answered no, to which they asked if I was a Jew. And then I said yes," says Søren, who was then told to find a different place to hang out, or he'll be killed. Søren contacted the police, who advised him to keep away from the area for a while. "I kept away for close to two months, but then I thought 'f--- no'." "This is a free country. Imagine if you couldn't wear a cross in certain places in Denmark," says Søren. But maybe he should have stayed away. "You will die, f---ing Jew"
The boys from the club didn't forget Søren or the Star of David. "I came in and there was an Arab man there who yelled and screamed at me. Then several of his friends came and they began to harass and push," Søren says. "I tried to calm the situation by putting my hand on the shoulder of the group's leader, but I should never have done that. He exploded and slammed me a respectable one. I was bashed so much that I couldn't breath. Finally he held me in a stranglehold and said, "Now you'll die, you f---ing Jew". Søren managed to finally get out and was attacked again outside the club, after which the police showed up, called by a witness. The agents stopped the violence, but Søren wasn't happy with their approach. "They told me that they couldn't do anything, since I was, in a way, out for it, when I wore my Star of David round my neck in an immigrant environment," says Søren. After a got a hospital report to document his injuries, the police took the case more seriously, says Søren. The attackers were never convicted, since nobody wanted - or dared - testify against them. Morgenavisen Jyllands-Posten saw the documents in the case, which confirm the sequence of events. Copenhagen Police did not want to comment on the case. "It's almost dangerous to go with something that can identify you as a Jew. I'm not the only one - Jew's kippah are regularly spit on," says Søren, that after this unpleasant experience removed everything which can identify him as a Jew. From Frederiksberg in Copenhagen to Vollsmose in Odense, Danish Jews are pelted with stones by angry Danish-Palestinians. Also when going out at night, Danish Jews have been denied entrance to discos by Danish-Palestinian doormen, if they wore Jewish symbols. The incidents reports from the Mosaic Faith Society and other scientific studies show that the instigators of the majority of antisemitic incidents have Middle-Eastern backgrounds. Of the 189 antisemitic incidents of violent, intimidating or harassing character, youth of Middle-Eastern background were responsible for 138, says the Mosaic Faith-Society. Peter Nannestad of the Department for Political Sciences at Aarhus University, is aware of this situation. In November 2009 he concluded in a report that a large proportion of Muslim residents share a widespread skepticism towards Jews. 65.8% of five immigrant groups answered that you can't be careful enough towards a Jew. The report also said that 75.2% of the interviewees didn't want a family member to get married to a Danish Jew. Additionally, 31.9% thought that there were too many Jews in Denmark. Søren is a fictional name, since he preferred to remain anonymous. The editors know his real identity. The United Nations has just created a new "entity" on women's rights, called U.N. Women. Elections to its governing board are now being organized. How long before Iran wins a seat? If the question sounds absurd, the realities at the U.N. are even more mind-bending. The most recent high-profile outrage on this score was Iran gaining a seat in April on the U.N.'s Commission on the Status of Women. But that's the least of it. The reality is that Iran, despite being under four sets of binding sanctions resolutions by the U.N. Security Council, has learned to manipulate the institution in ways that make a mockery not only of the U.N. itself, but also of U.S. claims of diplomatic competence. Rarely remarked upon, but even more appalling than Iran's beachhead on the women's rights commission, is Iran's seat on the 36-member executive board of the U.N.'s flagship agency, the U.N. Development Program, headquartered in New York. Iran actually chaired the UNDP executive board last year, during the thick of the bloody protests in which Teheran's mullocracy was beating, jailing and killing protesters calling for democratic development in Iran. That same UNDP executive board, with Iran still in its lineup today, also serves as the governing body for the U.N. population fund (UNFPA) and the U.N. Development Fund for Women (UNIFEM). Iran's three-year term on the UNDP board expires at the end of 2010. But have no fear that Iran will be shut out of U.N. high councils on the status of women--or, for that matter, issues involving children and food aid. The newly created entity, U.N. Women, with or without Iran on its board, will be holding joint meetings with the executive boards not only of the UNDP, but also of the New York-based U.N. children's agency (UNICEF) and the Rome-based World Food Program (WFP). Iran sits on the boards of both UNICEF and the WFP, where its terms extend, respectively, through the end of 2011 and 2012. Iran also fields a hefty presence among the governing councils of U.N. outfits involved in matters germane to weapons, outer space and global crime. Through 2012 Iran--the world's leading terrorist-sponsoring state--is a vice chair of the Executive Council of the U.N.'s Organization for the Prohibition of Chemical Weapons (OPCW). Iran sits on two major commissions of the Vienna-based U.N. Office of Drugs and Crime (UNODC), including the UNODC's 20-member Commission on Crime Prevention and Criminal Justice, where in 2009 it won a three-year-term. And this past April Iran won a seat with a four-year term on the U.N.'s Geneva-based Commission on Science and Technology for Development--never mind its brazen violations of U.N. sanctions on its rogue nuclear program. Monmouth street in the popular London shopping district of Covent Garden is experiencing its own micro-downturn - and it's nothing to do with the credit crunch. Shop-owners have had to call in the police as demonstrations and counter-demonstrations outside the London branch of Israeli skincare shop Ahava - famous for its Dead Sea products - have driven away customers. One shopkeeper said that protesters were "running down the road chasing people with flyers", and a shop opposite Ahava, Miss Lala's Boudoir, has closed down because of the disruption caused by the protests. Colin George, manager of clothes shop The Loft, next door to Ahava, said: "I'm worried about my business. There are protesters every fortnight with around 50 people each time. The police put barriers on the highway, but usually they spread out across the street handing out leaflets. It doesn't look good for the street. "People avoid them because they shout slogans and hand out leaflets. People don't like it. They don't know which shop they are protesting outside. The figures have dropped on Saturdays by about 20 per cent. Shoppers don't turn up until three o'clock when the protesters leave." The manager of the nearby Orla Kiely store said: "It can be intimidating for families to walk past those protesters. They run down the road chasing people with flyers." Shop owners called a meeting with local police after concerns were raised about the effect the fortnightly protests were having on other stores. Police have now said there can be no more than 12 protesters at a time in both pro-Palestinian and counter demos, and have banned them from using megaphones. They have also cordoned off a section of the road to stop protesters obstructing other stores. Protesters from environmental group Greenpeace disabled some of BP's 50 petrol stations in central London on Tuesday in protest at the Gulf of Mexico oil spill. Greenpeace and BP said activists stopped the flow of fuel by flipping safety switches on forecourts before removing them to prevent the service stations from reopening. BP described the action as "an irresponsible and childish act" which interfered with safety systems. "The action shows a total disregard for the safety of motorists and staff at the sites," a BP spokeswoman said. She said one of the sites affected is used to supply ambulances with fuel. Olympia’s Food Co-op has grandly announced its intention to boycott Israeli products unless that country disbands itself as a Jewish state. To earn a place for its products on co-op shelves, Israel must forfeit its right to defend itself by tearing down its security fence and must bring back the Arab refugees who, in an entirely self-inflicted calamity, fled in 1947-48 rather than accept the U.N.’s two-state solution. This is a policy of politicide: Israel may not exist as a Jewish state. Olympia Food Co-op members will get another chance next month to discuss a controversial board decision to boycott Israeli products at its two stores. Nine of the co-op board’s 10 members voted Thursday to participate in the international boycott. Harry Levine, a staff representative to the board, said he didn’t take a stand on the issue. Not everyone on the co-op staff agrees with the decision, Levine said. He said that outside of his role as a board member, he supports it. The board voted to boycott Israeli products as a way to “compel Israel to follow international law and respect Palestinian human rights,” according to a statement the board released. The boycott announcement has been posted on the co-op’s website, www.olympiafood.coop, as well as at its two stores. Israeli products removed from the stores include gluten-free crackers, ice cream cones and a moisturizing cream, Levine said. Nice to see they left a little money. 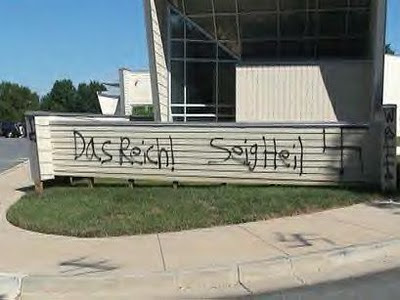 Vandals struck a Montgomery County synagogue, spray painting Swastikas and anti-Semitic slogans on the outside walls, parking lot and light posts, according to police and a synagogue member. The vandalism at B’nai Shalom Synagogue of Olney, in the 18400 block of Burtfield Drive, was discovered early Monday morning, police said. The anti-Semitic phrases, scrawled using black spray paint, included “work will set u free,” a reference to a sign that hangs over the Auschwitz concentration camp, and “Death 2 Zionists.” The vandals also used German, writing phrases including “Juden raus,” which means Jews out and was used by Nazis. “This is absolutely inappropriate and very, very hateful,” said Montgomery County police spokesman, Cpl. Dan Friz. He said the vandals also tossed change near the front entrance.